Tsunami waves hit western Greenland after huge landslide - 01:00 UTC, June 18, 2017. Seismologists returning from studying the rare event hope that the data they have collected will improve models of landslide mechanics in glacial areas and provide a better understanding of the associated tsunami risks. They warn that such events could become more frequent as the climate warms. 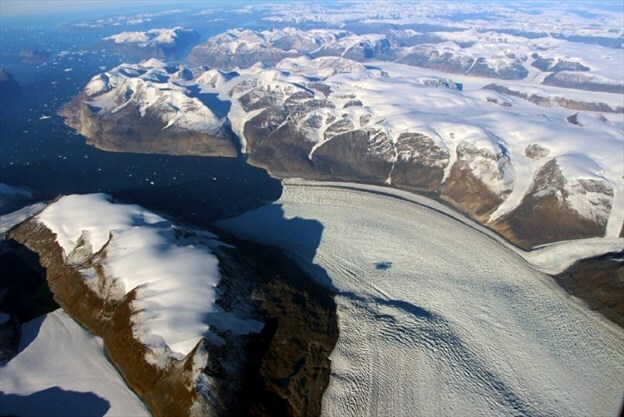 Chunks of glacier shattered when a powerful tsunami ripped through a fjord in western Greenland in June. 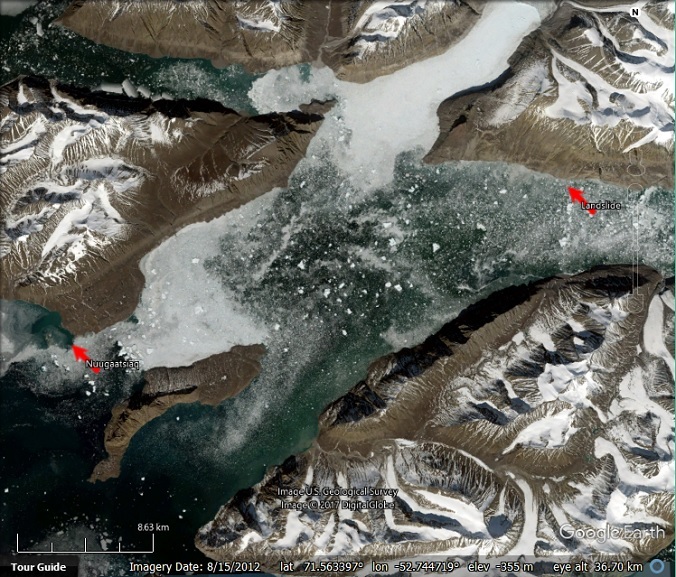 The landslide occurred on the evening of 17 June, in the barren Karrat Fjord on the west coast of Greenland. 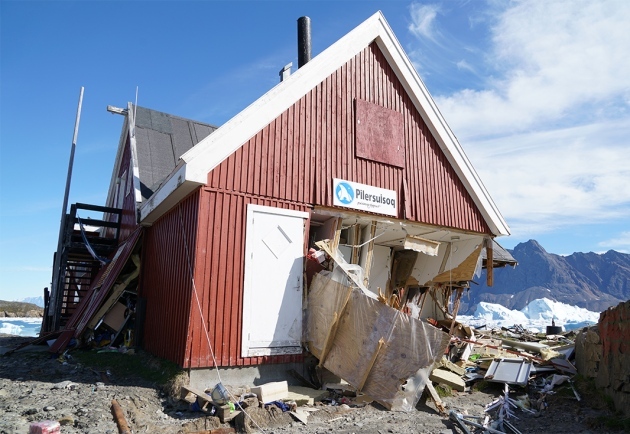 It caused a sudden surge of seawater that wreaked havoc in the fishing village of Nuugaatsiaq, located on an island within the fjord about 20 kilometres away (see ‘Greenland tsunami’). The wave washed away eleven houses, and four people are presumed dead. The right half of the highlighted area shows the scarred hillside in Greenland’s Karrat Fjord after a landslide fell a kilometer into the water below, causing a tsunami that reached 90 meters. The left half shows at-risk areas. The trip was funded by National Science Foundation and the Geotechnical Extreme Events Reconnaissance Association. The slide was so large that it generated a seismic signal suggestive of a magnitude-4.1 earthquake, confounding initial efforts to identify its cause, says Trine Dahl-Jensen, a seismologist at the Geological Survey of Denmark and Greenland. But more careful examination indicated no significant tectonic activity just before the landslide. 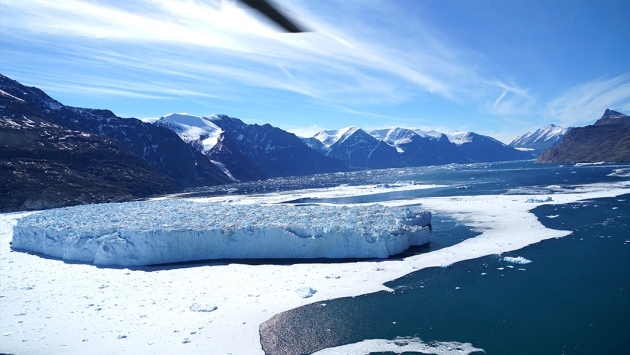 A research team that visited the site earlier this month found that a large volume of rock had plunged — probably spontaneously — from one of the steep sides of the fjord into the water 1,000 metres below, and shattered chunks of a glacier. That disturbance pushed water levels up by more than 90 metres along the coastline on the same side as the slide. And although the tsunami dissipated quickly as it crossed the deep, six-kilometre-wide fjord, it still had enough energy to send water 50 metres up the hillside opposite. The team also measured an increase in water levels of about 10 metres on shorelines 30 kilometres away. A deadly tsunami hit a remote region of Greenland, leaving four people presumed dead. Dozens more were injured and 11 homes were washed away. The area near the small town of Nuugaatsiaq has a population of about 84. Experts think the tsunami could have been caused by a rare 4.0 magnitude earthquake or possibly by a large landslide in the area that could have tricked sensors into registering a seismic event. The relative positions of the landslide and Nuugaatsiaq. Such information is sorely needed, says Costas Synolakis, a tsunami researcher at the University of Southern California in Los Angeles who was not involved in the Greenland survey. In cold, glacial regions, rocks and ice are held together on steep rock sides, and rising temperatures could make these slopes unstable and these events more common. Rink Glacier on Greenland's west coast. Synolakis says that his team has documented in detail only two landslides near glaciers. The tsunami wreaked havoc on the small village of Nuugaatsiaq, located on an island within a fjord. Researchers have noted another potentially imminent landslide in the Karrat Fjord, says Fritz, where a slow trickle of rocks could turn into abrupt slide. Residents of three villages in the region have been permanently evacuated to the nearby town of Uummannaq. Fritz adds that the Greenland event is reminiscent of a 1958 tsunami — the tallest ever recorded — in Lituya Bay, Alaska. A magnitude-8.3 quake triggered a landslide into a narrow fjord and the bay’s shallow water, causing the water to rise 500 metres above the normal tide level (a measure known as run-up). By comparison, the 2011 quake-triggered tsunami in Japan, which killed more than 16,000 people and caused the Fukushima nuclear disaster, reached only about 40 metres at its maximum height. “Earlier, we didn’t really believe such extremes were possible,” he says. NOC : Why are landslide generated tsunamis dangerous?